Article taken from Good Old Boat magazine: Volume 2, Number 6, November/December 1999. As you are aware, proper helm balance is a very desirable factor on a sailing yacht and can make the difference between a craft that is enjoyable to sail and one that has a helm that would rupture a gorilla, exhausting and exasperating her crew. The ideal vessel will have about 3 to 4 degrees of weather helm and will still retain a light and easy feel to the tiller or wheel under all conditions of weather. Excess weather helm, besides being extremely tiring for the helmsman, adds unnecessary resistance and can make it difficult, or even impossible, to jibe. Weather helm is a term that describes a yacht that sails with her tiller, or quadrant if she is wheel steered, slightly angled to the windward side of the vessel. This is a vital safety factor, as such a yacht will turn to windward, head up into the wind, and simply luff if the helm is released. With the opposite, lee helm, the yacht would turn to leeward and risk a knockdown or a dangerous accidental jibe. Also, having 3 to 4 degrees of weather helm improves performance. The rudder steers the yacht, of course, but it can also provide lift and reduce leeway if there is a slight weather helm, acting like the flaps on the aft end of an airplane's wing, in effect. Conversely, a bad lee helm gives negative lift, adds resistance to slow the yacht, and can make it difficult or impossible to tack. Perfect weather helm in all conditions of wind is eminently desirable but not always possible. It is not uncommon to find a yacht with a neutral or even a slight lee helm in light air changing to a moderate weather helm as it breezes up. Such a helm is acceptable since leeway in light air is not a serious problem, nor is an accidental jibe. In any case, such a helm is preferable to having moderate weather helm in light air that increases to a bear of a weather helm as the breeze stiffens. Of course, the helm balance will change as sails are reefed or changed down, but the experienced skipper will determine which reefed sail combinations provide the best balance as the yacht is snugged down for a blow. It must be noted that a heavy, tiring helm can be mistaken for a strong weather helm, yet the two can be worlds apart. If the tiller or quadrant is only 2 to 4 degrees off the centerline and the helm is still too heavy for comfort, then the cause is probably not helm balance but, rather, a too-short tiller or, with a wheel steering system, a quadrant that is too small or a wheel of inadequate diameter. These problems are readily corrected. Actual helm balance is governed by the lead (pronounced leed) of the rig. The lead is the amount that the center of effort (CE) of the sail plan is forward of the center of lateral plane (CLP) of the hull, and the figure is usually expressed as a percentage of the LWL. If the CE is too far aft, the lead will be small, and a heavy weather helm will result. If the CE is too far forward, the result is excess lead and a dangerous lee helm. At first glance it might seem that the boat will balance well if the CE is directly above the CLP, in effect no lead. However, the locations of the centers are calculated from a flat sheet of paper and it is obvious that these are not the true centers of pressure of a yacht that is heeled and moving through the water. When the boat is underway, the CE moves forward and to leeward due to the shape of the sails, the eased sheets, and the angle of heel. Also, the true hydrodynamic center of lateral plane of the boat moves well forward of the geometric CLP when the boat is close-hauled, but moves aft as she bears off. So the true centers are not easy to pin down except by testing in tanks and wind tunnels. As a result, the designer will usually work with the geometric centers, some general rules for lead, plus his own experience and intuition when drawing up the sail plan. The longitudinal position of the CLP is simple to locate if you have a profile drawing of the hull. Copy the drawing up to the LWL on a piece of tracing paper, cut it out, crease it to stiffen it and balance it on a pin or sharp pencil. Ensure that the ends do not hang down by folding it parallel to the LWL a few times as required to prevent this. Note that it is only necessary to locate the longitudinal position of the CLP. The vertical position is of no importance in the lead calculation, although it is necessary for stability work and masting calculations. In working out the CLP, some designers omit the rudder area, most use the forward half or third of the rudder area (me), and a few use all the rudder area. The individual designer will interpret the results based on his experience. The mainsail area is calculated by multiplying the luff (P) by 1/2 the foot (E). The foretriangle area is the hoist (I) multiplied by 1/2 the base (J). 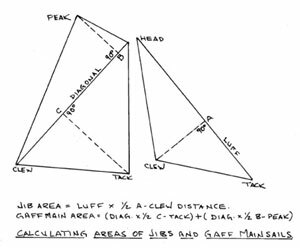 See sketch on Page 63 for calculating the areas of individual jibs and gaff mains and mizzens. 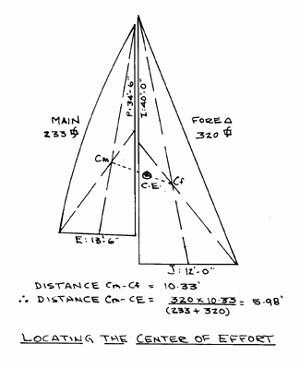 To find the center of a triangular mainsail (Cm), draw a line on the sail plan from the mid-length of the boom to the head of the sail and another from the clew to halfway up the luff of the sail. The roach is usually ignored, and the center is considered to be where these two lines cross. For a gaff mainsail, divide the sail into two triangles, find the center and area of each using the above technique and obtain the center of the sail by using the formula below or, more simply, use the geometrical system shown in the diagram. 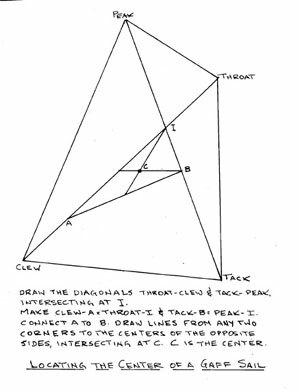 To find the center of the foretriangle (Cf), draw a line from the tack point of the headsail to a point halfway up the mast and another from the masthead to a point on deck halfway between the mast and the tack. Again, the point of intersection is the center of the area. With these centers found, and the areas worked out, the location of the overall CE of the sail plan is readily calculated. Connect the two centers, Cm and Cf, with a line and measure its length, L. Then the distance that the CE is from Cf = (Main area x L)/Total area main and foretriangle (see example at left). The foretriangle area and center are used if genoa jibs are to be set but if only a working jib is carried, its center and area may be used instead. In the case of yachts with bowsprits and multiple headsails but no genoas (i.e., a Friendship sloop), it is a matter of choice whether to use the foretriangle area and center or work out the overall center and total areas of the individual sails. In any case, the areas of light sails - such as fisherman staysails, mizzen staysails, main topsails, etc. - are ignored when working out the overall sail area and CE. Some designers use half the mizzen area in the calculation of the overall CE of yawls and ketches. However, I feel this may be an error which could result in insufficient lead since it tends to result in a CE further forward than if the actual mizzen area is used. 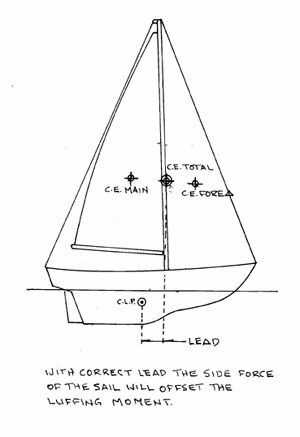 Once you have the CE and the CLP, it is simple to mark them out on a sail plan of the boat, measure the distance between them, and calculate the lead as a percentage of the load waterline (see illustsration above). However, even leading authorities do not always agree on the proper amount of lead to give different types of yachts. I suggest the reader take with a grain of salt anything they read about lead in the otherwise excellent books written by Chapelle, Kinney, Baader, or Henry and Miller. The problem is that hulls and rigs have changed greatly over the years, and the definitive leads given in these books do not take into account the variables of hull form, beam, rig height, etc. in contemporary yachts. These have changed drastically, and they all affect the amount of lead required to obtain a balanced helm. For example, Kinney states that a schooner requires a 5 to 7 percent lead; Baader recommends 3 to 5 percent. Yet our 1960s Ingenue schooner design started life with 10.5 percent lead and still had to have her bowsprit lengthened to correct excess weather helm. Baader suggests 4 to 6 percent for a "beamy, long, keel yawl and ketch," and our beamy, long, keel ketch Traveller III balanced beautifullywith 22.5 percent lead. The second edition of Kinney's work did come close with a 20 percent recommendation for a ketch but with Baader's 4 to 6 percent lead, the Traveller III would have had an impossible weather helm. Kinney also comes close in suggesting a 14 to 19 percent lead for sloops, but I've had a yacht with 17.5 percent lead develop such a heavy weather helm that we had to move the mast a foot forward. Obviously, a number of factors affect the amount of lead required for a balanced helm, and these factors simply cannot be taken into account by any table that simply says "a ketch requires x-percent lead." Consider two yachts, otherwise identical except that one is heavily built and has a 35 percent ballast ratio, the other is lightly built and has a 50 percent ballast ratio. In a stiff breeze, the more lightly ballasted boat will heel to a greater degree, her CE will move farther to leeward, and the luffing moment will be higher than that of her heavily ballasted sister. The more tender hull will require greater lead in order to maintain a reasonable weather helm. Similarly, consider two identical hulls with exactly the same sail area but one has a low, broad rig, and the second has a tall, high aspect ratio rig. The yacht with the tall rig will heel more in a breeze and her CE will move even farther to leeward due to the height of the rig. Thus she will need more lead in order to eliminate excess weather helm. There are many other factors that affect lead and some of these are noted in the chart on Page 64. Some of these factors will seem to contradict each other. Wide beam creates a stable hull, but it also tends to result in full waterlines forward. A narrow beam may mean a tender hull but also fine forward waterlines as a rule. Obviously a certain amount of interpretation and experience is required when designing a hull/rig combination so each new design has to be analyzed, and the sail plan must be designed to suit. A rough estimate of the percent of lead necessary can be obtained by starting with a figure of 14-15 percent and adding 1 percent for each characteristic of the boat that falls into the Lengthening column and subtracting 1 percent for each characteristic in the Shortening column in the table above. This is not a very scientific rule to live by, but the whole issue of helm balance and proper lead really comes down to intelligent guesswork based on previous experience. There is no sure way to pin it down any closer than that. Some examples: A narrow (-1%), heavily ballasted (-1%), long keel (+1%), shoal draft (+1%), yawl (-1%) with fine forward waterlines (-1%) and a high-aspect-ratio rig (+1%) works out to a required lead of 13-14%. A beamy (+1%), lightly ballasted (+1%), short keel (-1%), deep draft (-1%), sloop (+1%) with full forward waterlines (+1%) and a tall rig (+1%) works out to 17-18% lead. In either case, these leads may be too small and our tendency today would be to use a slightly longer lead than derived as above, but never a shorter one. In that regard, Bill Luders taught me that it was very unusual to find lee helm on a modern hull and that most yachts could stand even more lead than they had. I quite agree. A modern beamy hull can stand quite a long lead but a too-short lead will result in a severe weather helm every time. Bill also felt strongly that the mast location in regard to the keel leading edge was as important as any consideration of lead. Bob Perry and I have discussed this and are in general agreement that locating the mast in the area where the fin of a modern fin-keel sloop or cutter meets the hull will usually result in a good helm. I must say that in my 40 years in this business, only one of my designs developed a lee helm and that was a boat with less than 11 percent lead. We had to shorten the bowsprit and cut some area off the aft end of the centerboard to correct it; very unusual indeed. The designer is fortunate. If he finds in the design stage that a boat has insufficient lead, he can simply pick up his eraser and move the mast, lengthen or shorten a boom, even add a bowsprit if necessary. The owner of a boat with a bad helm is not so lucky, for the cure is going to require more than an eraser or a fresh sheet of paper on the drawing board. It can mean a costly stay in a boatyard! If your boat does have a problem, first calculate the actual lead and compare it to the designs of other yachts of similar type to ascertain if you truly have a lead problem. I suggest this because poor balance can be caused by warped rudders, skegs, and centerboards, and even by baggy sails. I even came across one production boat that had good balance on one tack and poor balance on another because her fin was not fitted perfectly down the centerline of the hull and, as well, was not vertical when the hull was at rest! These problems are usually hard to discover and even harder to correct, but examine the yacht carefully in any case. If the helm problem is not a result of one of the above aberrations, then you can try to alter the lead by making one or more of the following modifications. Move centerboard forward, if possible. Problems that cannot be corrected by the above changes will probably require a major rig change or an alteration to keel shape, rudder, skeg, etc. In such cases, the advice of a competent yacht designer should be sought. 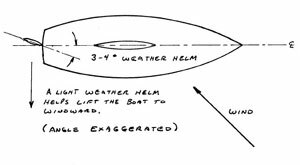 The result of your changes and experimenting should be a weather helm of 2 to 4 degrees, and that, in turn, will result in your boat taking on a new life as regards handling ease and even performance. It is well worth some tinkering, especially if you have developed arm muscles like Popeye from fighting a runaway weather helm. Ted Brewer is, simply put, one of our favorite people and a terrific naval architect. Seems like this should be enough.